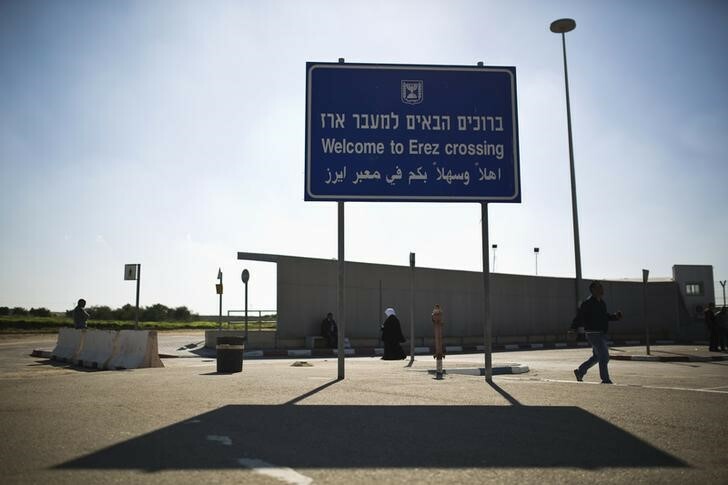 Jerusalem - Israel plans to reopen a second border point for commercial traffic into the Gaza Strip, an official said on Monday, a step in gradually easing the blockade imposed on the Palestinian enclave since 2007. The decision to allow trucks through the Erez terminal, on Gaza’s northeastern tip, was taken in recognition that a truce that ended the 2014 war against Hamas is holding, the official said. Israel says its blockade prevents the movement of militants and stops construction materials that could be used by Hamas to make bunkers and tunnels. Palestinians there say they are under siege and are unable to rebuild homes destroyed by Israeli bombing. Israel halted commercial traffic through Erez in 2000, after a Palestinian revolt erupted, and only passengers transit has been allowed since. Changing Gaza policy is politically sensitive in Israel, as Hamas, while holding fire, remains openly hostile toward it, so the announcement was kept low-key. Regional powers Egypt and Turkey also have a close interest in what happens in Gaza. Egypt, which has the only other border with Gaza, has helped Israel maintain the blockade, deeming Hamas a threat. Turkey has said improving relations with Israel is dependent on the blockade ending. The official said the decision was mainly aimed at reducing pressure on the sole crossing point currently handling commercial traffic, Kerem Shalom in southeastern Gaza, as well as reducing truck traffic on Israeli roads leading to it. Erez will eventually handle at least half of the around 600 trucks that go through Kerem Shalon daily, the official said. Asked whether the new measure could herald an overall increase in exports to Gaza, the official said, “No problem, to the degree that it depends on us,” meaning that the border could be closed again in the event of Palestinian attacks. Gaza is home to 1.95 million Palestinians, 80 percent of whom are dependent on aid, according to the United Nations. Economists say the current levels of imports have been enough to maintain basic living standards but not to generate recovery, and unemployment has spiraled from 28 percent to 43 percent since the 2014 war. “Gaza needs cement, all kinds and sizes of lumber, raw chemicals, iron for metalworks, all of which have ceased completely,” said Mahed Al-Tabbaa, a Palestinian economist. Brilliant idea. Now the Palis can bring in more supplies for their tunnels.